Much of our mortal fear about sharks is without substance, although certain precautions should be taken. After all, the ocean is suited more for fish than humans. However, surfers, unlike your regular landlubber, tend to take chances. They push their luck. They surf when there are shoals of fish around, such as sardines or mullet, or when floodwater from rivers deposits organic material in the sea, making the water brown and murky. This happens in the Transkei and KwaZulu Natal, when summer rains swell the rivers. Some South African surfers ignore bleeding cuts, and continue surfing. The author has been guilty of this when surfing in the Transkei. Also, twice I have continued surfing after seeing a shark, once in the Transkei when a large hammerhead cruised past, and another in Port Alfred, when a 2 metre ragged tooth was caught off the West Pier during a heat in a university surfing competition. Some sharks, particularly the beautiful Great White, are seen as killing machines blindly and constantly on the hunt for blood. This is not necessarily true. They are generally elusive, wary and selective in their hunting habits. 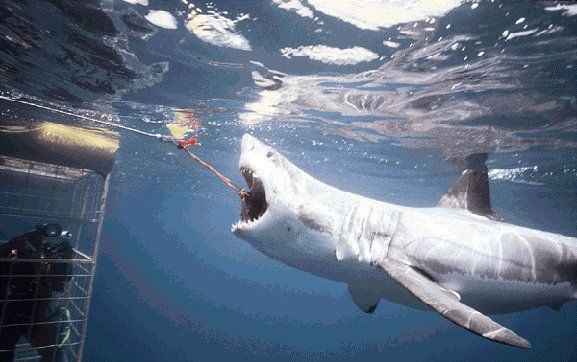 When they attack people, it is often a mistake, although there have been cases of Great Whites coming back for seconds. 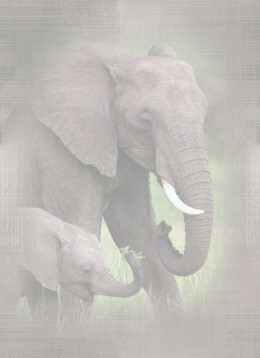 South Africa is home to a number of species that have been known to attack people. 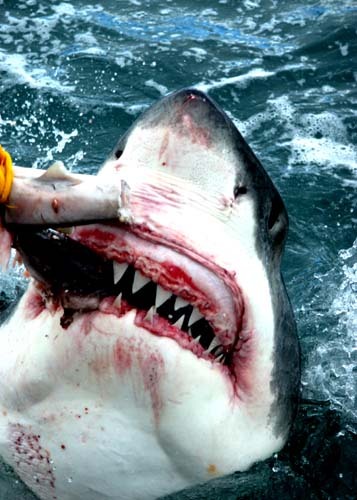 The bulk of attacks come from the Ragged Tooth, Tiger, Zambezi, Hammerhead and Great White sharks. However, it is the 'unholy trinity' of the Tiger, Zambezi (Bull) and Great White that make up the majority of attacks on humans. However, it must be stressed that surfing is a safe sport in South Africa, especially if the right precautions are taken. For the Great White, perhaps the most maligned of the shark species, contributing to the most hype and hysteria, there is plenty of prey. The Great White feeds mostly off huge colonies of Cape fur seals, which numbers in the hundreds of thousands off the Cape. Remember, the number of shark attacks are relatively rare. You have far more chance of being killed by a falling coconut in Thailand than being killed by a shark in South Africa, so don't get all woesie about going surfing. 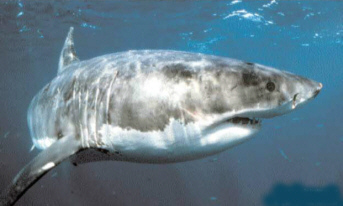 For more information about sharks, check out this web site http://www.oceanstar.com/shark, a fascinating shark resource. 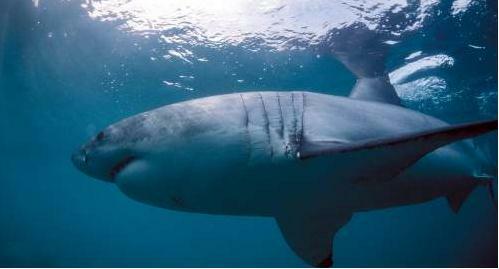 South Africa recognises the value that Great Whites play in our eco-system. The species, which came close to being endangered a few years ago, is protected by law. 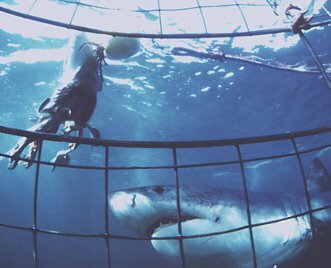 South Africa pioneered an international convention to protect Great Whites from attack by humans. There are a number of myths about sharks that need to be straightened out. Sharks don't especially like humans. In fact, they try and avoid them where possible. People are not their normal prey. Most Great White attacks on surfers occur as a result of mistaken identity with seals. In most cases, a shark will back off after realising it's mistake. Sadly, the damage done to the victim during the initial hit can - in rare cases - be enough to end their life. A common perception is that sharks are stupid. However, it has been proved that they are complex creatures that can even be trained. 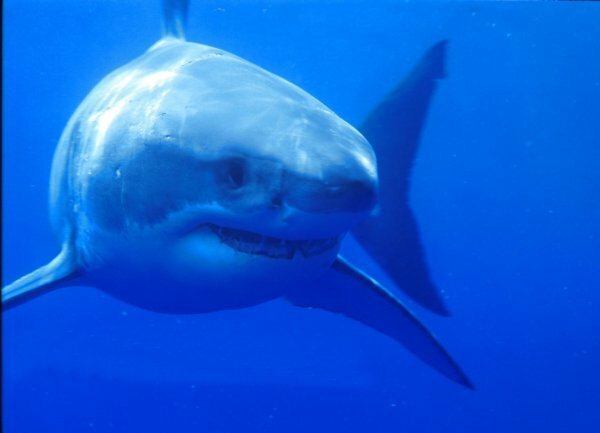 Many people think sharks are virtually blind, but have sensitive hearing and sonar capabilities to detect prey. While sharks are sensitive to noise - they can detect potential prey thrashing about in the water - this is a fallacy. Sharks see different colours, and have good eyesight, often many times more sensitive to light than human eyes. The Great White uses sight as the primary means to "lock on" for an attack. Neither are sharks scavengers or feeding machines constantly hunting for food. Most sharks have specific diets. Great Whites, for instance, mostly prefer seals. Some sharks eat plankton. Others snack on fish. 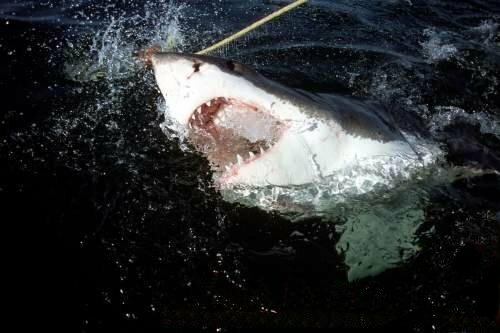 In the False Bay area of South Africa, Great White sharks have been known to exhibit similar patterns to Killer Whales. When attacking a seal, they have been known to strike their victim from beneath, hitting the hapless mammal into the air. On it's way down, the seal is caught in the convulsing jaws of the shark. The Great White has the ability of making it's jaws protude, giving it more elasticity when devouring prey. 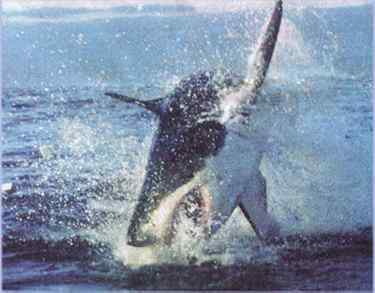 During the chase, Great Whites often leap into the air. So does the Mako shark. 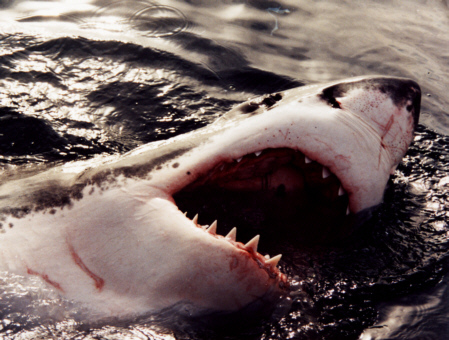 There have been shark attacks in South African waters. With the introduction of nets, the number of attacks decreased dramatically in KwaZulu Natal, a traditional hunting ground for the Zambesi and Tiger sharks, two lively predators. 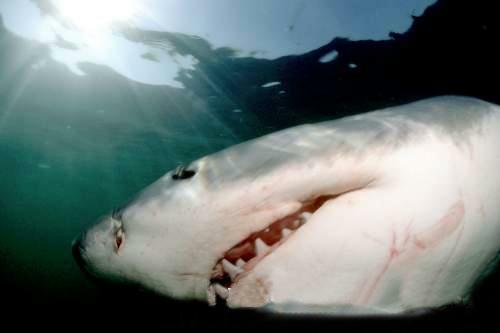 The most sharky spots, where at least one attack has been recorded in the last 10 years, are Ntlonyane (Transkei), Nahoon Reef (East London), Igoda Mouth (East London), Fish Boma (Knysna), Amanzimtoti (KwaZulu Natal), Gonubie Point (East London), Gansbaai (near Hermanus) and Keurboomsstrand (Plettenberg Bay). don't surf with a bleeding wound. The author lived and surfed in the Transkei - traditionally viewed as a sharky spot - for 10 years and only saw a shark once while surfing (see above reference to hammerhead shark). Timing is another factor when surfing the East Coast of the country. The best times of the year are autumn, winter and early spring, between March and October. The summer months are hot and humid, with a lot of rain, which makes the water more sharky than usual. It's much smaller than the Great White or Tiger - up to 3 metres. It's a heavy looking fish - hence the name Bull - and accounts for many attacks in KwaZulu Natal and Transkei. Common in warm seas, especially around river mouths, it travels up rivers looking for food. When the Transkei rivers are in flood, cows and other animals drown and are washed downstream. Apparently, some Zambezi sharks have been found 3700 km from the sea in the Amazon! Known as an opportunistic feeder, the Zambezi often attacks without reason. Perhaps the most dangerous shark. Lives in tropical waters. Common off the coast of KwaZulu Natal. Grows big, up to 6m. Not as discerning as the Great White. When it attacks, it keeps going with particular voracity. Has been known to bite or bump boats. Grows to 6 metres. Second to the killer whale as a marine predator. Feeds on seals. Found off the waters of the Cape. Nomadic, elusive and wary fish. Known to breach while chasing prey. A beautiful prehistoric beast.